Inspired by the popular high-wheel bike of the old-times, the Highwheeler™ is a creatively designed bike rack with a modern twist. Line your sidewalk with these whimsical bike racks, and add vintage charm to your bike parking area. This bike rack will comfortably park two bikes, one on each side. The unusual style and design of this bike rack allows for endless creative applications and uses. Electro Polished Stainless Steel finish process produces a superior corrosion resistance and appearance which can be achieved by no other method of surface finishing. 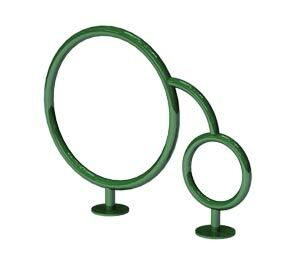 The Highwheeler™ bike rack is available in both in-ground and surface mount options. Each bike rack is available in galvanized steel, powder-coated steel, powder-coated stainless steel, and electro polished stainless steel. Drop In Anchors available for concrete installation.